5SOS release new album ‘Youngblood’ out now! Today, Capitol Records released ‘Youngblood’, the new studio album from 5 Seconds of Summer (5SOS). Following the band’s self-titled 2014 debut and 2015’s ‘Sounds Good Feels Good’ – which each entered the Billboard 200 at No. 1 – ‘Youngblood’ expands 5SOS’ musical parameters while retaining the hooks and trademark DNA that’s always been a massive part of their appeal. ‘Youngblood’ – the album’s title song – is a global smash hit, with cumulative worldwide streams already surpassing 150 million. The single has also taken the No. 1 slot on both Apple Music’s biggest pop playlist, ‘Today’s Hits’ and Spotify’s ‘Today’s Top Hits’ playlist. The track has also hit Spotify’s Global Top 10, topped Australia’s official singles chart for three consecutive weeks and is No. 1 in New Zealand. Watch the ‘Youngblood’ live video, filmed across the band’s sold out 5SOS3 Tour, HERE. ‘Youngblood’ is the follow up to the album’s first single, ‘Want You Back,’ which debuted at No. 1 on iTunes in over 18 countries earlier this year. The band returns to the Plaza for a performance that will be broadcast on NBC’s ”TODAY” show on Friday, June 22, as part of the 2018 Citi Concert Series. 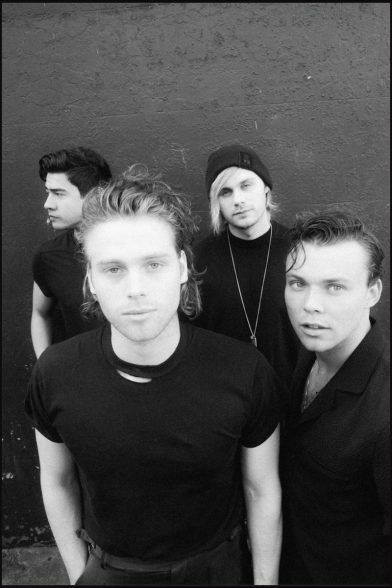 Following 5SOS’ five-plus years of recording and touring behind its first two albums, the band relocated from Australia to Los Angeles to find a new set of collaborators, influences, and inspirations. They wrote and recorded the bulk of ‘Youngblood’ with the Swedish producing-writing team Carl and Rami (Nicki Minaj, Madonna). Other collaborators include Andrew Watt and Ali Tamposi (Camilla Cabello), producer/instrumentalist Mike Elizondo (Dr. Dre, Eminem, Fiona Apple), producer/engineer Noah Passovoy (Maroon 5), J Kash (Maroon 5, Charlie Puth), Asia Whitacre (Hailee Steinfeld, Zedd) and Andrew Goldstein (Linkin Park, Simple Plan). Hailed as the “biggest new rock act in the world” by Rolling Stone, 5SOS is the only band (not vocal group) in history to see its first two full-length studio albums enter the Billboard 200 at No. 1. 5SOS’s self-titled debut album has sold more than three million units worldwide, with 1.5 million albums and more than 4.5 million single tracks sold in the U.S. alone. 2015’s ‘Sounds Good Feels Good’ charted at No. 1 in 12 countries, including the U.S., the U.K. and Australia. ‘She’s Kinda Hot,’ the album’s first single, topped the iTunes charts in 44 countries. 5SOS – comprising Luke Hemmings (vocals/guitar), Michael Clifford (vocals/guitar), Calum Hood (vocals/bass) and Ashton Irwin (vocals/drums) – has won an American Music Award, a People’s Choice Award, an iHeartRadio Music Award, five MTV European Music Awards, two ARIA Awards and an MTV Video Music Award.